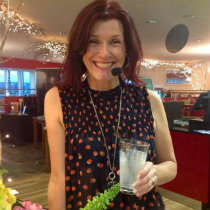 Nicky Marr: Broadcaster, magazine editor, event host, columnist and writer. Sign up to receive my weekly columns by email. I’m Nicky Marr, an experienced writer and editor, event host, broadcaster and presentation skills trainer living and working between the Highlands and in Edinburgh. If you’re looking for a confident and inspiring presenter/MC for your business conference, awards ceremony, product launch, food and drink festival or book/film/music festival event, you’ve come to the right place. Whether your ideas are fully formed or we’re starting with a blank sheet of paper, your event will be safe – and fun – in my hands. Maybe you’re looking for an engaging and warm presenter or a sparky, insightful contributor? I’m your woman. I have 20 years’ experience behind the microphone, both in commercial radio and with the BBC. From food to fitness, the arts and the online world, parenting and relationships, there’s not much that I don’t have an opinion about. After 20 years as a columnist, magazine contributor and the editor of Connect for Highlands and Islands Airports Limited and FlightLOG, the in-flight magazine for Scotland’s Airline, Loganair, I know how to create content that audiences like to read. That translates to your business too – I can help you articulate what you do to your customers. Whether it’s a series of case studies for your website or an in-depth article for an industry publication, we should talk. My warm Northern Scottish voice will add credibility to your Corporate DVD, training videos, online courses or ad campaigns. You’ll have heard my voice on radio ads and in theatres, on telephone systems and in visitor centre films all over the place! Let’s bust the myth – presentation skills are business skills that can – and should! – be learned, just like any other. If you lack confidence about speaking in public, I can help. In just two 2-3 hour sessions I can set you on the path to making your presentations and speeches shine, and help you overcome those pesky nerves. I’ve broken it down into easy, memorable elements, and the results speak for themselves. I regularly deliver ‘Present Yourself with Confidence’ courses to senior pupils across Highland for Government agency DYW. I’m also a qualified coach. How would your company be reflected in the media if the worst happened? Media training is an insurance policy against news-reel gaffes. I can help you work out what to say and how to say it on camera or into a microphone. I can help you understand the key messages your customers and the wider public need to hear in order that your brand and reputation are protected. I can give insider tips on journalists’ techniques, and let you practice that media interview. And it’s and all completely bespoke and confidential. Whatever has led you here, you’re in the right place. Browse a while, then drop me an email and we can arrange to chat. The coffee (and cake!) are on me.